A perfect, healthy, vegan, gluten-free treat for a chilly fall or freezing cold winter day. 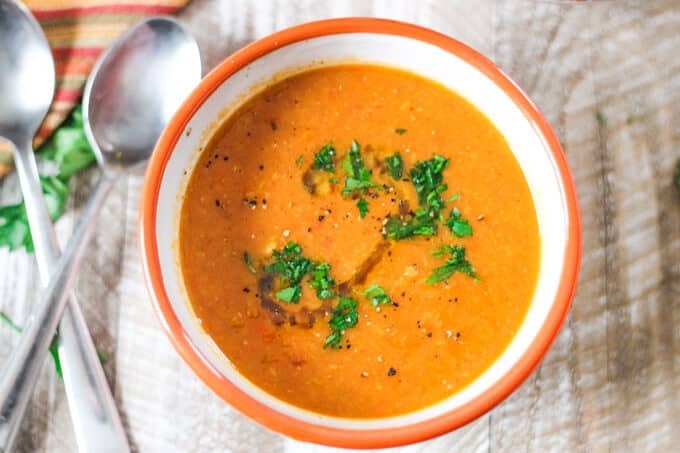 Tomatoes Red Lentils Coconut Soup...doesn’t it sound amazing? 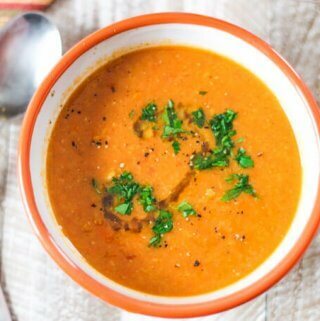 This Tomatoes Red Lentils Coconut Soup recipe was originally posted on February 16, 2016 and is, far & away, the most popular soup recipe on this blog. 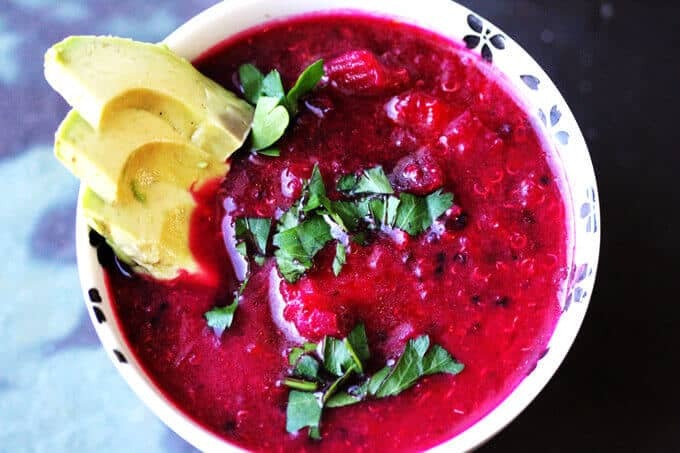 Therefore, I wanted to bring it back to life, as the colder days are quickly approaching on the east coast of US, and this soup is the perfect compliment. 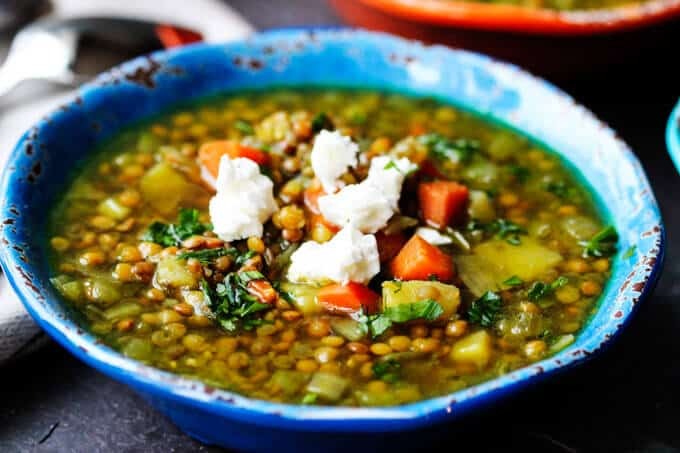 Not only is this soup very popular on Pinterest, but it was also featured in ELLE Decor and Country Living Magazine. I can assure you there’s something about it and I encourage you to try. If you do, please make sure to let me know in the comments how you liked it. When I came up with this recipe, I was inspired by an Indian Daal dish that I once made. It contained red lentils, cauliflower, tomatoes and coconut milk….and, of course, Indian spices. But the combination was something that really resonated with me. The marriage of the flavors was perfect. One time when I made this dish, I actually brought it to work and asked my Indian friend to try it (the gauntlet). She was stunned and said that it tasted like her mother’s. I thought it was a huge compliment. Then I thought that if lentils, tomatoes and coconut went so well in this dish, I repurpose them in a soup. And so, that’s how my Tomatoes Red Lentils Coconut Soup was born. I absolutely loooove tomato soups. And when I was growing up the tomato soup looked totally different than the ‘cream of tomato’ soup so well know in US. Polish tomatoes soup is made based on broth (meat, vegetable, etc…), with a tomato paste, and finished with a little mixture of flour with cream to thicken it up. We serve it either with noodles or rice. With that said, I am indifferent, I love every kind of tomato soup. 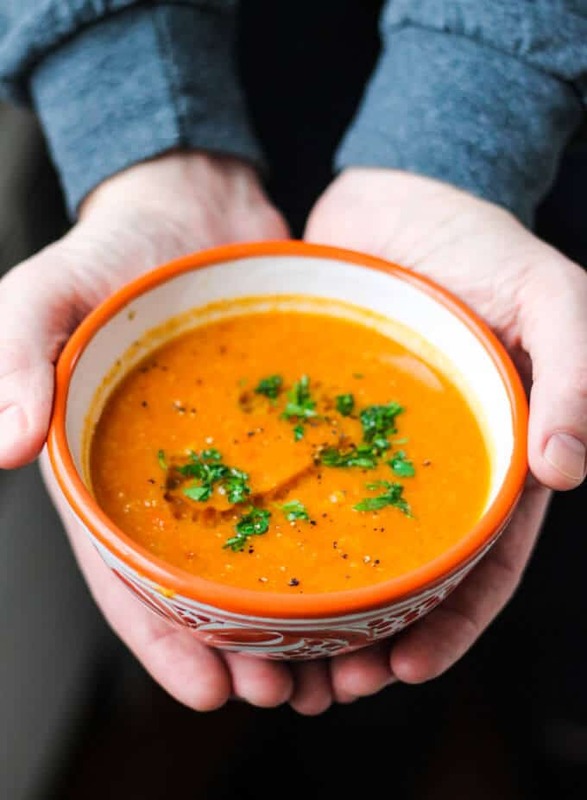 Whether it’s Polish, American or my new version of super healthy vegan, gluten-free and “coconutty” tomato soup. I’ll take them all, immediately, if not sooner. Apparently my 4-year old shares this obsession. He ate this soup like it was nobody’s business. You start by sautéing some onions, add tomatoes, rinsed lentils, cover with broth, add salt & pepper, and then let it simmer, until the lentils are cooked through. At the end, add coconut milk and, just like that, you’re done! 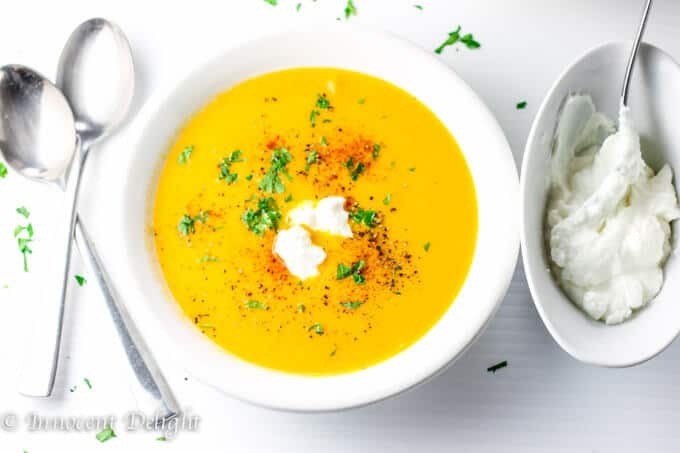 I like to puree some of the soup to thicken it up, but this step is optional – depending on whether you prefer soups more chunky or creamy. 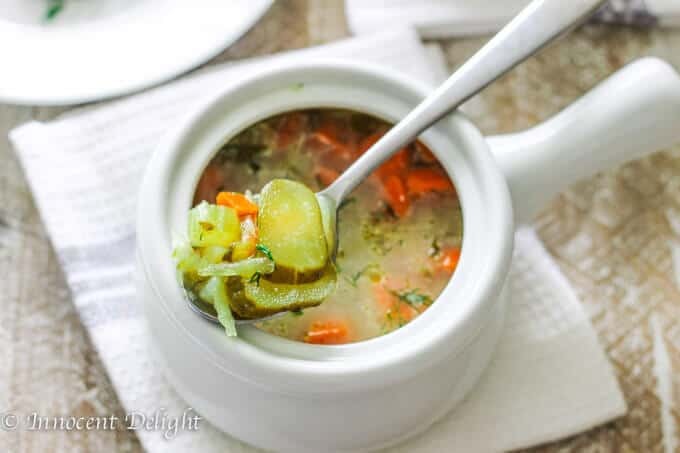 You can sprinkle some parsley on top and enjoy this amazing soup on a chilly fall or cold winter day. Serve it with homemade crusty bread and you’re good to go. In fact, I’m running to the kitchen to get another bowl. Perfect healthy, vegan, gluten free treat on chilly fall or freezing cold winter days. 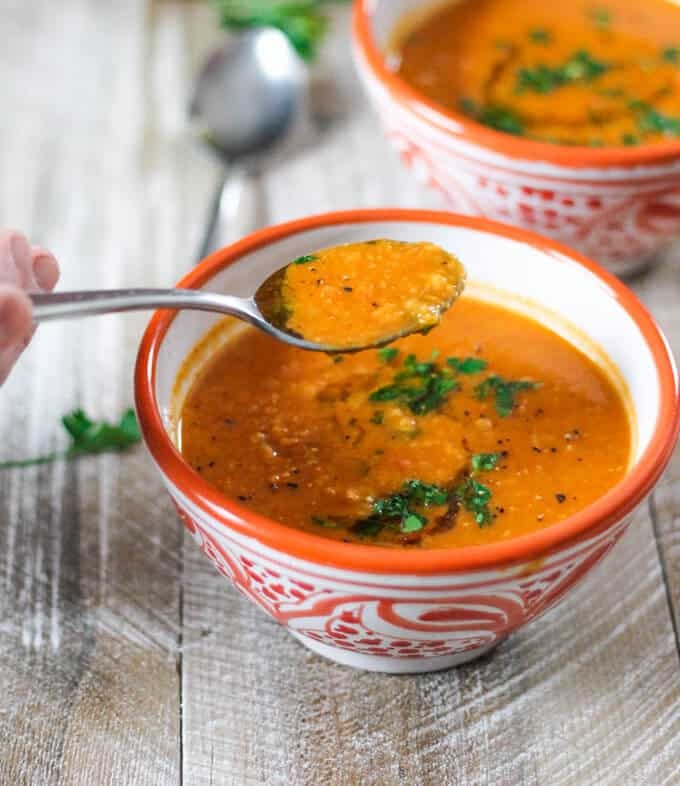 Tomatoes Red Lentils Coconut Soup - doesn't it sound amazing? Serve with parsley, olive oil and cracked pepper. I encourage you to FOLLOW Eating European on FACEBOOK | INSTAGRAM| PINTEREST | TWITTER for all the latest recipes and updates. Just made this soup step by step and it is awesome! I think I may have added a wee bit too much salt. It’s still delicious. I will be taking a bowl to work for lunch all week. Absolutely, you can freeze it. Instructions mentions one can of tomatoes, however, this is missing in the Ingredients list. Are a can of tomatoes a part of the recipe ingredients or were they mistakenly added to the instructions? Thanks for clarifying, this looks like a great recipe. never mind my mistake, i see it now in a different browser. Sorry. Hands down one of my favorite recipes that my boyfriend and I love! So healthy and delicious! Thanks for sharing this easy recipe! Thoughts on making this is a crockpot? I’m sure it will come out great. Give it a try and let me know how you liked it. OMG…..This so is so delicious and easy easy easy to make. 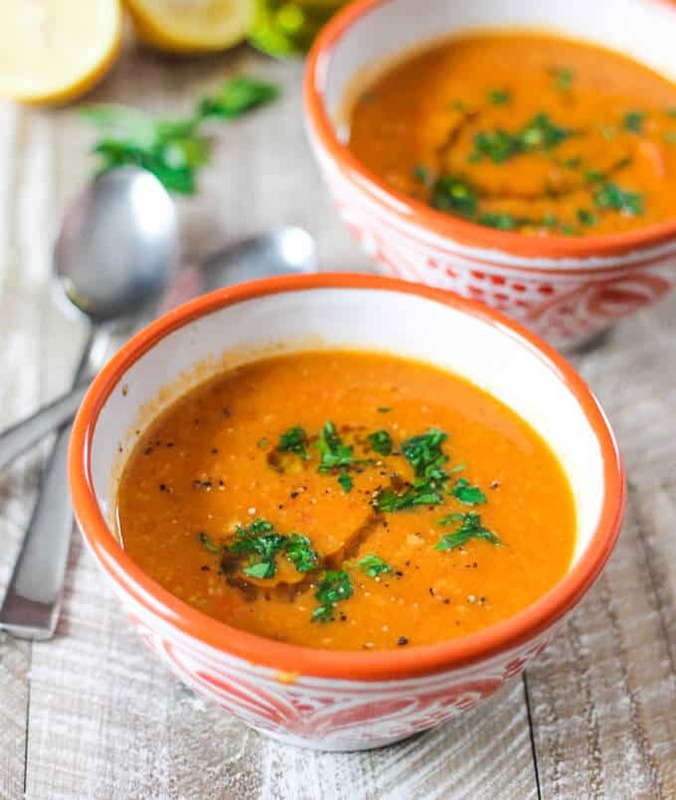 I’m in an early fall soup mood, and this color is so inspiring! Thank you Sue. I hope you will like it! This sounds like a must try recipe for fall! This looks so hearty and comforting! 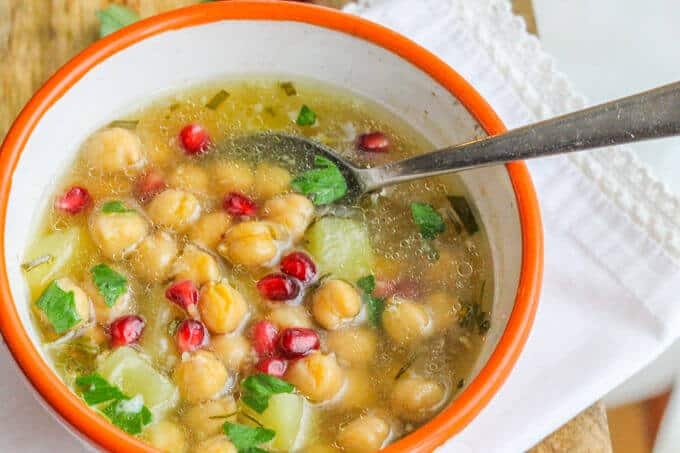 I love homemade soup recipes so much and am always looking for new flavour combos to try; this one is being added to the list! Great. Thanks Annie. I hope you will like it! I actually have all the ingredients needed for this soup in the pantry! Dinner is served — looks really good! Thanks Lisa. I hope you will like it! This sounds soooo good! I’m experimenting with cutting meat out of my diet this week. It’s not hard at all, but my biggest problem is getting enough protein! (I workout a lot so I need it to build muscle…). I like my meals to have at least 20g of it so I would have to play around with this one to see if I could beef it up. Indian flavors are my favorite though so if I can’t I would definitely use it as a side dish to something else when I’m back to eating meat!